I didn’t care for my original Schlumpf Mountain Drive because the 2.5x under-drive felt “mushy” to me, it had a tendency to slip inside the bottom bracket, and it leaked a fair amount of oil. 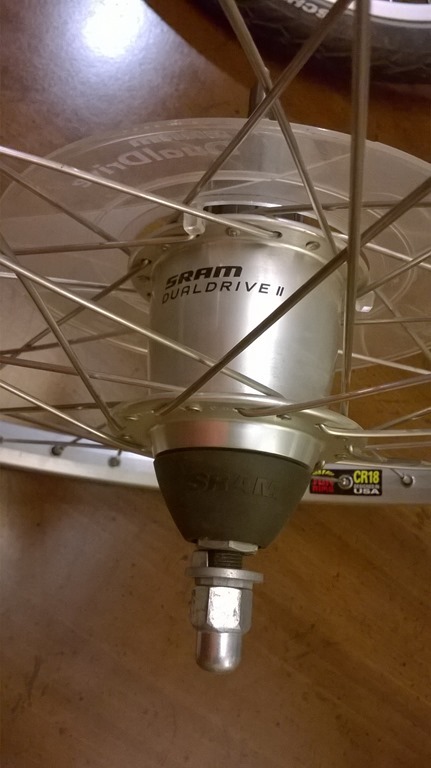 I absolutely loved my SRAM DualDrive and put a lot of miles on a couple of hubs. But when I installed one on my brand new ICE Q back in 2008, every time I went over a bump it sounded like I’d tied tin cans to the back of the trike. 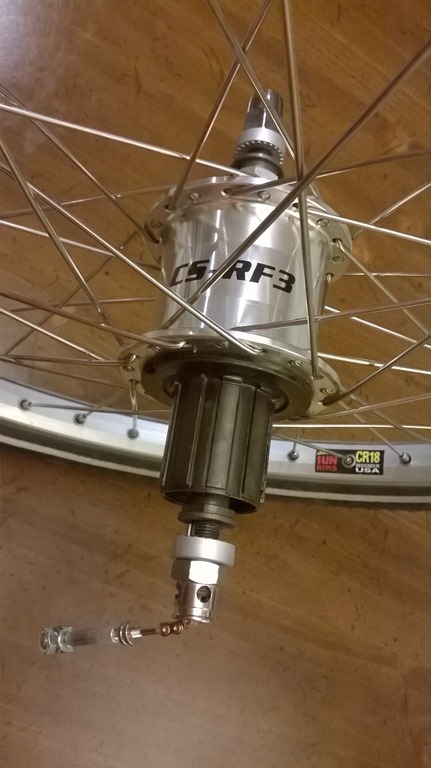 After trying several different DualDrive hubs and more recently the Sturmey Archer equivalent CS-RF3 (same problem) on a couple of different trikes I concluded that the noise was inherent in the designs and that it would eventually drive me insane. Note that it might be possible to reduce or even eliminate the noise by tearing down the hub and doing a better job than the factory of lubricating it. The Sheldon Brown site discusses lubricating IGH’s in some detail. To me It seems likely this would be a temporary reprieve at best and I’m reluctant to try to improve a factory-new hub. If anyone wants to try their own luck I can offer several of these IGH’s built up into awesome 406 20″ wheels. For trikers like me, almost any IGH has the advantage that it can completely solve the 20” drive wheel problem. The problem is that the smaller wheel shifts your gearing range down, significantly reducing your top end (the speed at which you can no longer pedal fast enough to add power). It’s easy enough on paper to fix this by simply increasing / decreasing the size of your chain rings / cassette. You can see this by playing around with a gear inch calculator. But this is much more difficult in practice because commonly available crank sets are designed for 26” and larger drive wheels. It’s much easier to play this game if you’re changing a single cog or chain ring that drives an IGH (at least in theory! More about gear ratio limits in a future post). Incidentally, the Shimano Capreo hub and external cassette (still standard on ICE trikes) solves this problem quite handily by providing a 9 tooth rear cog instead of the usual 11. But this comes at a cost—Shimano no longer makes the part, so it is proprietary to ICE as far as I know. The small cog requires a different lock ring and spline design so standard cassettes aren’t compatible. And the small cog is more prone to skipping when your chain and/or cog gets worn. The result is a cassette that wears out faster and is something like 4 times the replacement cost of its standard counterpart. The cool thing about the combination internal/external hubs like the DualDrive and CS-RF3 is that the internal hub replaces your front triple crank and derailleur with a roughly equivalent 3-speed gear range. On the flats, a strong rider can use the external gears for occasional fine tuning and do most shifting with the quicker, easier internals, whether pedaling or stopped. For me the spacing of the internal hub is perfect for quick acceleration on my relatively flat commute and for shifting back down after (or during) a rapid stop that on a conventional drivetrain would leave me in way too big a gear to accelerate away. Or you can use it like a conventional front triple and limit the internal shifts to big changes in topology, doing most shifting on the external gears. These things use a standard spline so you can stick nearly any size modern cassette on them—from 7 speed to at least 10. Not sure about 11 speeds back there. I really like ditching the front derailleur—in addition to eliminating a pretty unsophisticated and fiddly drivetrain component and cleaning up the chain line, it reduces chain wrap to the point you can run a short cage rear derailleur. This is a big deal with a 20” drive wheel where the chain nearly drags the ground, picking up crud from the road and making the derailleur more susceptible to damage. For a long time I was convinced this was the ultimate setup for me. Until I started noticing the rattle. So I’m back in the IGH game with some hesitation but on an initial glance it seems the Shimano Alfine and latest Schlumpf hubs may not suffer from these particular problems. And the (external) simplicity, much simplified chain line, quick shifting, shifting while stopped, and freeze-resistant controls are pretty interesting to me. Even cooler than a single chain ring up front is complementing it with a single cog in the rear. Chain line perfection. I had a Dual drive my my trike and now on my Streetmachine – never noticed a rattle. Have you been unlucky, or me lucky? That’s a good question. I’ve read a couple complaints about similar rattle with the DualDrive but I don’t have a good explanation for why it’s such a consistent problem for me. The obvious difference is that I changed trikes, but now the rattle reproduces in a different trike as well. All I know is that, for me, the rattle is very real and very annoying. If not for the rattle I’m sure I’d still be running the DualDrive, it really is a great gearing solution. If the Alfine works out it will be an even better solution for me. I’ll start testing it on the trike soon, hoping this one doesn’t rattle.